Currently I have Maintenance Plans configured to backup SQL Server databases to local drives, then the files are picked up by Commvault nightly, and my SQL server maintenance plan deletes the backup files after they are a few weeks old. I don't like backing up SQL server to local drives, every once in awhile commvault fails, and my hourly backups are useless--if I lose the entire server I have to go back to the last nightly from commvault. What I would like to do instead is have SQL server backup to a network share, then have commvault grab the backups from there. SQL server doesn't seem to be able to backup directly to a folder over the network, but I was able to backup to a network share by creating a Device with sp_addumpdevice. Basically this creates a file on the network share that SQL sees as a device, but the problem is instead of getting one file per backup I get multiple backups within the file. I can set backups to expire, which I assume means that backups will start to re-use expired space... but I'm afraid commvault will backup this large file each night instead of just the new backups. So, is there a way to do backups to a network share with individual backup files for each database for each backup? Just put a UNC path into the 'folder' textbox under 'Create a backup file for every database'. Personally, I check 'Create a sub-directory' as well. Works perfectly for me. Not the answer you're looking for? Browse other questions tagged sql-server backup sql-server-2008 database-backup or ask your own question. 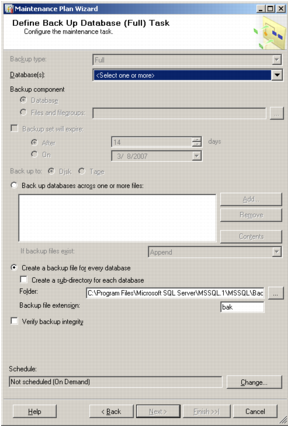 Is it possible to configure SQL Server 2005 to auto-compress backups?